In applied Bayesian statistics, the results of the research typically consist of the posterior distribution over the space of parameters. These posteriors are usually smooth continuous functions, approximated numerically with the set of samples obtained with methods like MCMC, IS or ABC. Good Visualization of such approximation is problematic, even if the posterior has only one dimension. On one hand, simple stack of all the samples is a noisy saw-like picture, very different from the function we are trying to approximate. On the other hand, by smoothing this picture we amputate a part of the results. The choice of the appropriate visualization tool is therefore the compromise between the readability and information content. But should it be like this? Is there a visualization method witch could aim for both? Lets show both the raw data and the difference between the raw and the smoothed data! This can be done in the several ways. The next figure demonstrates the proposed methods. 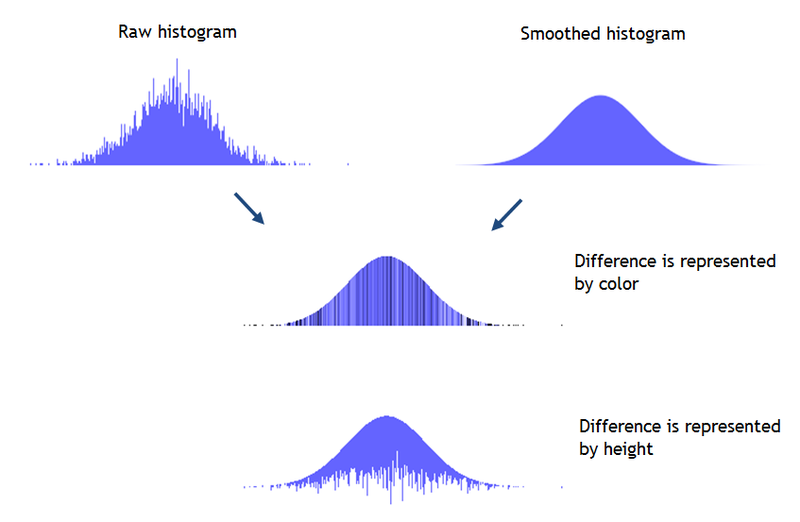 In the fist case, the smoothed histogram is shown, but the difference between the raw and smoothed histograms is coded with concentration of ink at each bin. In the second case, the difference is moved to the cellar of the histogram. These methods have several benefits. When having large number of samples, all visualization methods work fine. With small number of samples, the proposed methods are more readable. When a wrong smoothing method is used, the mistake would be evident from the non-random pattern in the color or heights, and can be easily corrected. There are other ways to construct histograms using the announced principle: show both the raw data and the difference between the raw and the smoothed data. I presented above only two of them, which I found most simple. 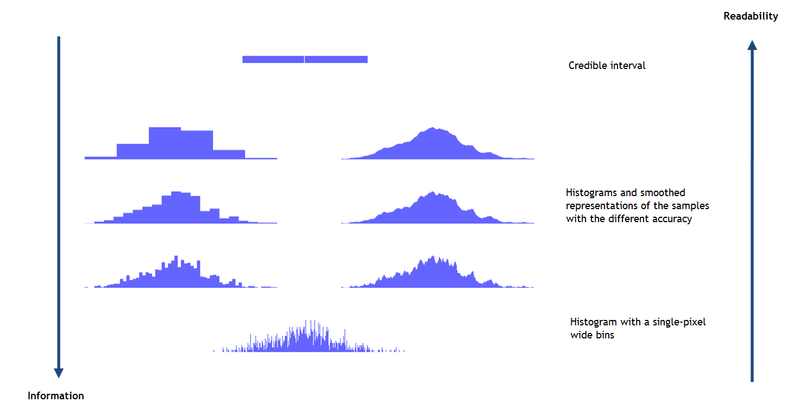 One of the alternative approaches would be to show the residuals as the separate histogram. It would be interesting to see if two-dimensional distributions could be improved in the same way.